While most party organizers use a combination of flamboyant decorations, staging and lighting to emulate a certain theme and create the perfect celebratory aura, they often leave behind some specific decorations that go a long way in adding that extra touch of perfection and bringing a smile on the guests. One such toy is the Donald Trump Pinata. Fashioned to look strikingly similar to Donald Trump, one of the biggies of politics, this little caricature can be used in a dozen ways to jazz up a certain party venue. The Donald Trump Pinata appeared soon after Trump made certain controversial comments on Mexican immigrants, but over time this toy has become immensely popular, thanks to birthday parties, political congregations and backyard barbecues. While most toys behold a cute, funny or cuddly appearance, this one begs to differ. 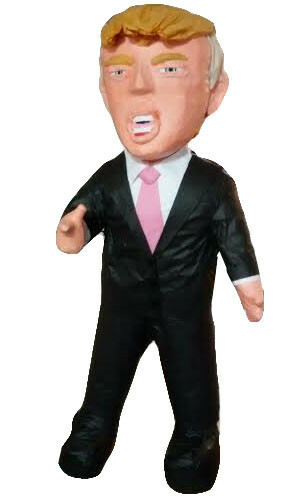 With its peculiar photogenic likeness to Trump, complete with the signature hairline and caustic eyes, this toy looks and feels every bit like the man himself! Its similarity to piñata makes it a huge hit at birthday parties. Whether you use it as a photo prop or a conversation piece, this bit of party décor is hard to ignore. Utility décor at Birthday bashes: The Donald Trump Pinata can be used in several ways and on several different occasions. It emerges successful in many imaginative ways. Many of these toys come equipped with separate holders for candies and toys, therefore they can be used in birthday parties to enthrall kids and keep them happy with more than enough chocolates. Party Gimick for political gatherings: This toy works remarkably well as a party game for typical political gatherings. By infusing the much -needed fun element in such high-brow gatherings, it sure does the job of easing out stress very well! Its lifelike similarity to Donald Trump only enhances its suitability. Many democrats choose to use the Trump piñata as a punching bag or a symbolic caricature to dispel orthodox views and embrace democracy. All in all, the Trump Pinata, with its strikingly similar hairline, menacing eyes and funny stature never fails to draw all attention towards itself and act as the ultimate mood elevator in any party. Being attractive in form, it appeals to both adults and children alike. As a party game, a meaningless décor, or a candy holder, it qualifies in equal measure. No wonder then, that the Donald Trump Pinata has become the sure way to transform a monotonous gathering into a rather fun-filled one with lots of political jokes, or for kids, just jokes. A pull string pinata is used in birthday parties where you do not want your little guests swinging a bat with gusto. While there is something to be said about how most kids enjoy smashing a pinata, pull string ones can be loads of fun too, especially when your guests are too young to safely handle a bat or a stick. 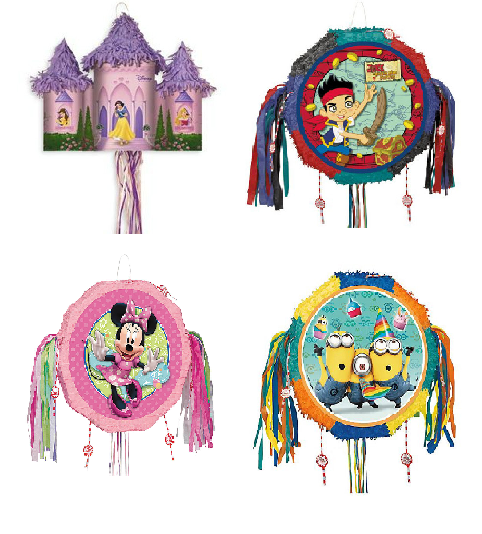 Just choose a place to hang the pinata from, indoor or outdoor, and fill it with goodies that the children will enjoy. The pinata can be the centerpiece before it is time to have fun with it. Usually, the little ones are lined up in order of height or age, whichever is lesser, in ascending order with the tallest / eldest one at the end of the line. Each of them gets to pull a string, but only one string will release the secret lock that empties the contents of the pinata. Once that happens, of course, there’s going to be a mad rush to collect the goodies. You might want to keep some extra candies (or whatever you filled the pinata with) to throw into the melee to ensure everyone gets something. It is also best to remain close enough to see to it that no one gets hurt while having fun – little fingers are notoriously easy to get stamped on in a pinata pulling scenario by equally cute little feet. Also, if there are toddlers in the party, you might want to shop for a pinata with soft release ribbons. Pull string pinatas are also great for occasions when your kid wouldn’t feel comfortable smashing up the pinata because it resembles a favorite character or looks too cute to destroy. And there are so many to choose from. 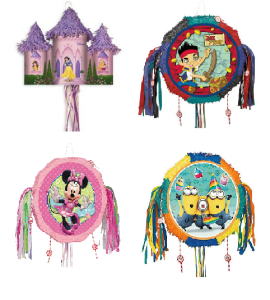 You could choose a Pink Ballerina Shoe pinata for your baby girl, a baseball, football, basket ball or beach ball pinata for your boy or from any of the Disney characters that your child is especially fond of. There’s Dr. Seuss Cat in a Hat pinata, and Mermaids or Seahorse if you are hosting an ocean themed party. For a child that loves heavy duty stuff, there’s an array of tractors, bulldozers and tanks to choose from. Some of these require a separate kit for turning them into pull string pinatas. Others come ready with ribbons attached. There are blank pull string pinatas too, to which you can tack on a balloon of your choice, or simply get down and dirty with your child to create the most unique pull string pinata ever. And the best part is that no matter what you may end up choosing, you just can’t go wrong with a pull string pinata – for all the little guests and the birthday baby, it is going to be the high point of the birthday party.